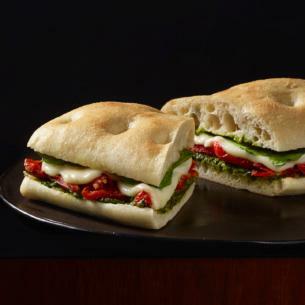 Roasted tomatoes, mozzarella, spinach and basil pesto toasted focaccia. focaccia roll (enriched flour [wheat flour, malted barley flour, niacin, reduced iron, thiamine mononitrate, riboflavin, folic acid], water, sour culture, extra-virgin olive oil, yeast, salt, semolina, cultured wheat starch, organic whole wheat flour, ascorbic acid [dough conditioner], enzymes), fresh mozzarella cheese (pasteurized milk, vinegar, salt, enzymes), roasted tomatoes (tomatoes, canola oil, garlic, vinegar, salt, spices), basil pesto (basil, canola oil, parmesan cheese [milk, cheese culture, salt and enzymes], garlic puree [water, granulated garlic], rice vinegar, butter [milk], ascorbic acid, sea salt, black pepper), spinach. Mozzarella cheese gets its name from the Italian verb mozzare, meaning “to cut” – a reference to the spinning and cutting involved in making this type of cheese.